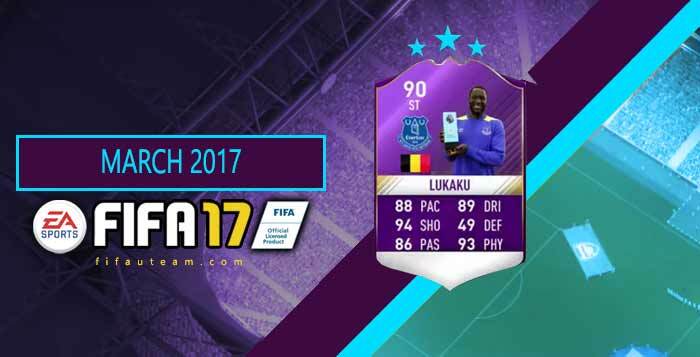 In this page you can find everything about the Premier League FIFA 17 Player of the Month, including the nominees and winners of each month, their new purple cards (POTM) and the squad building challenges. 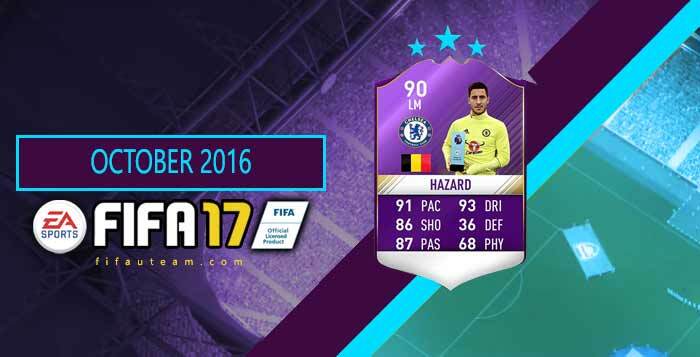 What is the FIFA 17 Player of the Month? 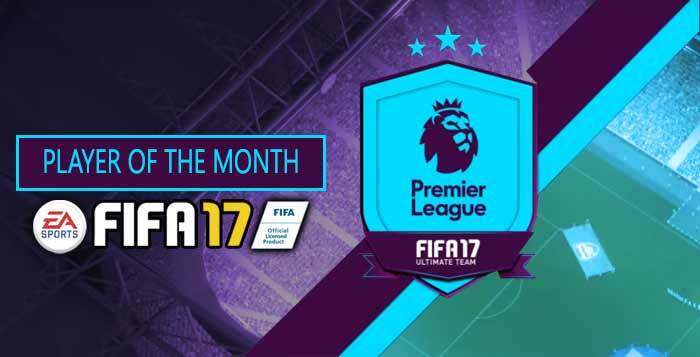 Every single month, EA Sports makes a selection of the most in form Premier League players of the previous month. The community votes in the favourite and the winner receives a purple FIFA 17 POTM card with boosted stats. Usually, EA also releases a new squad building challenge around the player of the month. In this page you can check all the POTM nominees, the winners, the results, the dates and the new FIFA 17 cards. The joint-highest scorer in April with five goals in four consecutive matches, including the one that put Spurs ahead in their late fightback at Swansea City. Benteke scored five times, including the winner at Chelsea and twice in the 2-1 win at Anfield. He created eight chances, including one assist, and won 65 aerial battles. No player created more than Eriksen’s 21 chances for Spurs, two of which resulted in goals. He also scored twice, including the 30-yard winner at Crystal Palace. Hazard’s four goals included both in the 2-1 win over Man City. He also created 18 chances, playing 141 passes finishing in the final third and completing 13 dribbles. The defender helped Manchester United to secure five clean sheets, while making 16 interceptions and winning 12 aerial duels as his team extended their unbeaten run. Played his part in Spurs’ five clean sheets, winning 90% of his tackles. In possession, he made 375 successful passes and completed eight dribbles. Scored five times across five different matches, including against Arsenal and Chelsea, while setting up a goal and creating 10 other chances. The Everton striker’s form has shown no signs of stopping and his four goals in three matches in March have taken the Belgium to the top of the PL scoring charts with 21 goals. The Polish goalkeeper has been a key figure in the upturn in results for AFC Bournemouth last month. One of 12 saves he made was from Zlatan Ibrahimovic’s penalty as the 10-man Cherries held out for a point at Old Trafford. The forward scored four goals in March, including shrugging off a missed penalty to grab a hat-trick against West Ham United. The player signed on loan from Liverpool in January has helped to tighten up Crystal Palace’s defence with two wins and no goals conceded in the month. The Southampton winger has returned to form with two goals in the 4-3 win at Watford and six chances created for team-mates over two matches. You can find investment tips specifically for the POTM of March clicking here. The Spurs striker’s prolific form continued in February with four goals, scoring the only one to beat Middlesbrough and a hat-trick that eased his team past Stoke City 4-0, setting up the other goal for Dele Alli. The Brazilian signed in January has had a quick impact, scoring his first goal in his second league start and both strikes in the 2-1 win over Swansea before injury struck against AFC Bournemouth. The Everton forward scored the most Premier League goals in February, with five in total. Four came in one match as AFC Bournemouth were unable to handle the Belgium forward. The Spaniard has been at the heart of Man City’s scintillating displays as they won all three matches in February. He scored one goal but no-one created more than his eight chances. The veteran central defender has not only made West Brom difficult to beat but his threat at set-pieces brought two goals in February, including the winner against AFC Bournemouth. The Hull goalkeeper’s heroics kept Man Utd at bay in the 0-0 draw at Old Trafford and thwarted Liverpool in the 2-0 win at the KCOM Stadium. In total he made 16 saves across the month. No player scored more than the Tottenham Hotspur midfielder’s five goals in January as the north Londoners stepped up their Premier League title challenge with three wins and two draws in the month. Alli scored twice against Watford in a 4-1 away victory on New Year’s Day, and repeated that feat three days later as Spurs ended Chelsea’s 13-match winning streak with a 2-0 win at White Hart Lane. The 20-year-old then triggered a fightback with the visitors’ first goal at Manchester City as Mauricio Pochettino’s men rallied from two down to earn a 2-2 draw at the Etihad Stadium on 21 January. That Everton enjoyed a 100% record in January with no goals conceded is in part thanks to their right-back, who struck the late winner at Crystal Palace and provided an assist. Harry Kane matched Alli’s five goals in January for Spurs, and the striker also assisted two goals for his team-mates. The Arsenal forward’s three goals included the one that started the remarkable fightback at AFC Bournemouth and the stoppage-time penalty to beat Burnley. The Swansea revival under Paul Clement has been spurred by the Iceland international, who struck the winning goals at Anfield and against Southampton. Ibrahimovic took his tally to 50 league goals in 2016 with five strikes in six December fixtures. After netting the winner at Crystal Palace, the striker scored twice apiece against Middlesbrough and Sunderland. Costa’s two goals and two assists helped Chelsea continue their unbeaten run. After a goal against Everton, Costa broke a stubborn Middlesbrough defence with the only goal at the Riverside. His run and cross also created Chelsea’s winner against Tottenham Hotspur. The striker struck three goals, including two at Burnley that turned the match round. He is the joint-leading scorer in the league. Ibrahimovic played twice but scored on three occasions, his two goals against Swansea City helping United return to winning ways. He also struck the equaliser at home to West Ham United in Matchweek 13. Revitalised in Antonio Conte’s new formation, Pedro was one of their key creators and scorers last month, scoring twice, including the crucial goal before half-time that started the fightback against Tottenham Hotspur. The West Brom midfielder had a stellar month, scoring twice and setting up three other goals. He scored and assisted in each of the wins against Leicester City and Burnley and provided the assist for the goal at Hull City. The Sunderland goalkeeper’s saves at AFC Bournemouth were a key factor in securing the club’s first Premier League win of the season and he repeated the heroics the next matchweek in the home win against Hull. The 2014/15 Premier League Player of the Year continued his resurgence through October with three goals, an assist, seven chances teed up for team-mates and 17 completed dribbles. The England goalkeeper played a major part in Burnley’s revival in October, making 31 saves to take his season’s tally to 57, 21 more than his nearest rival. Eleven came in the match at Old Trafford where Heaton defied all that Manchester United could throw at him. The Welshman thrived in his new No 10 role, scoring as many Premer League goals (three) in the month as he managed in total in his two previous seasons. Allen also created six chances for team-mates, including two assists, as Stoke recorded three wins in a row. An ever-present in October, Kante has been the linchpin of Antonio Conte’s new 3-4-3 formation. As well providing the team a defensive solidity that meant they did not concede in October, Kante laid on six chances for team-mates, completed 247 passes and scored a memorable goal against Manchester United as Chelsea won four matches out of four. Man City fans had to wait until October to see their summer signing in action, due to a knee injury, but the German did not disappoint. The creative verve he brings to City was demonstrated by 251 successful passes, 81 of them in the final third, and the nine chances he laid on for team-mates, including an assist. Gundogan also weighed in with two goals, against West Bromwich Albion. If Kante has been Chelsea’s driving force, and Hazard the wizard on the wing, Costa has represented Chelsea’s cutting edge. The Spain forward maintained his early-season form, scoring three goals as well as providing an assist, to take his tally to an unrivalled eight for the season. Coutinho continued to shine brightly in Liverpool’s exciting attack throughout October. The Brazilian was at the heart of everything, laying on 13 chances for team-mates, completing 14 dribbles and 92 passes that finished in the final third, He also scored a wonderful goal, his fifth of the campaign, against West Brom. Son burst into life with his first match for Spurs in 2016/17, scoring twice in a 4-0 win at Stoke City, with his second nominated for the Carling Goal of the Month award, and producing another brace at Middlesbrough. A key player to Manchester City’s 100% record during September, scoring two goals and providing two assists for Pep Guardiola’s side. Matching De Bruyne’s creative output with two goals and two assists as well as a passing accuracy of 88%, Lallana’s strike against Leicester City has also been nominated for the Carling Goal of the Month award. Romelu Lukaku has been involved in more goals in September than anyone else, scoring a hat-trick at Sunderland on 12 September, a wonderful free-kick against Crystal Palace and a goal and an assist against Middlesbrough. The Arsenal forward has hit the ground running this season with his two goals helping his team to three wins in September, the first time in a year Walcott has struck more than once in the league in a calendar month. Revitalised by the arrival of Pep Guardiola to Manchester City, Sterling has been a key component among the Citizens’ varied attacking threats that have brought three wins out of three. With two goals, one assist and winning a penalty for a goal in the opening-day match with Sunderland, the winger has posed opposing defences constant problems this season. The Hull City captain has been a rock in the heart of the Tigers defence as the promoted club returned to the Premier League to beat Leicester City, the champions, on opening day, win away to Swansea City and hold out against the might of Manchester United until stoppage time. No player has made more than Curtis’s 21 interceptions this season and he boasts 100% tackle success in the three matches. The Belgian winger has been a key part of the perfect start enjoyed by the Blues this season. With two goals, including a wonderful dribble and finish against Burnley in Matchweek 3, Hazard has been a constant threat for Chelsea’s opponents this season. No player has made more successful passes in the final third of the pitch than the Belgian. Antonio Valencia is part of a Manchester United defence who have conceded just one goal from three matches, with two clean sheets as part of their three wins, but his danger to the opposing defences has stood out, too. Only one player has provided more successful crosses this season than the Ecuadorean’s five and no defender has received more passes in the final third than Valencia. The nominees will be announced in the coming days. Any ideas about the december’s one ? The nominees will be announced very soon. Come back here to know them. I don´t usually watch PL matches. Who are the favourites for November´s award? Agüero or Diego Costa maybe?? Most of the community thinks that Diego Costa will win. The vote for October’s winner will close at 23.59 GMT on Monday 7 November. Because of the international break, the winner will be announced on Friday 18 November. Hazard and Allen are the favourites this month. Join the discussioYour probably gonna need more than that if it turns out to be hazard. 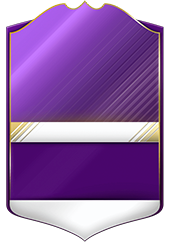 Im guessing you will need around half a million coins in order to squad build your way to glory. Either way i think Hazard deserves it with Allen a close 2nd.